Last month's meeting was the showing of "Charleston", which was the program Larry put together from the vintage stereoviews in my collection. Larry really did a great job and the program got great compliments at the Convention. For those of you who missed both Charleston and last month's meeting, maybe we'll get around to showing it sometime in '04. This months meeting is the 2nd Friday - October 10th. It is COMPETITION NIGHT ! So bring those treasures you took this summer (or any summer, or fall or....) We all saw some fantastic material in Charleston but we are also reminded of how much talent exists in this club. So dust off those slides and cards and share them with the world. 770-925-9085. We seem to have the same 7 people do this year after year. Hope to see you all there on October 10th. This month's meeting is the 2nd Friday, February 14, 2003. We meet at the Briarcliff Baptist Church. Get off I-85 at Clairmont and turn right on Briarcliff Road. The Church is on your left. Park near the entrance that says "OFFICE". Walk all the way down the hall to the room marked "PAL". In response to several newer members’ comments, each program this year will have an informational session. The first is going to be older cameras. I will bring in an assortment of commonly available stereo cameras from the 19050’s and 1960’s – Realist, Kodak, TDC Vivid, TDC Colorist, Belplasca, Busch Verascope f40, Iloca, Iloca II, Revere and Realist 45. They will be available for perusal and discussion. I know something about the Realist, Kodak and Iloca II, but could use some help on some of the others. I will not bring the lower level cameras such as Tower. We will look at View-Master and Meopta in November as part of the View-Master projection. I will also have information on repair manuals and videos for the cameras, as well as people who are still actively repairing such cameras. This is a group exercise, so bring along your knowledge, especially about the cameras which I haven’t used before. on South side of Sycamore St. Library is second building on right. Also, see the ASA website at www.Georgia3D.com that Steve and Suzanne have created. We hope to put up images and articles in addition to the meeting notices. Yep, you missed it. But don’t worry, Peter Bahouth, Steve Hughes, Suzanne Hughes, Ken Kistner, Lamar Kennedy and I will tell you all about for the next several years, so it be almost like you were there in person. In addition to ASA members, there were four other people that we met from Georgia, making Georgia the second highest state in attendance, trailing California by quite a margin. Mike Durrett was there from Ellijay, giving Ellijay the highest percentage attendance of any city in the country! The Egyptian Theatre is one of the old classic Hollywood movie theaters from the golden era of the silver screen. It is a bit older than the better known Chinese Theatre. A few years ago, it was extensively redone, with most of the seats taken out to add an indoor lobby. The theater now seats about 750 people. 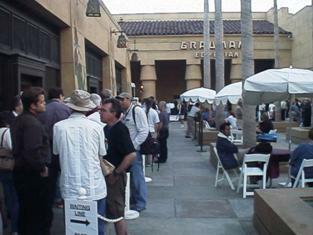 On Friday afternoon, the pass holders assembled in front of the theater, eagerly awaiting the opening of the ticket and trinket booths. The organizers weren’t too organized and weren’t quite ready for the eagerness of the group. Eventually, everything fell into place. There were 35 different screenings – 33 movies and two programs of shorts. After each one, the theater was emptied and everyone had to get in line for the next one. There were four lines, one for pass holders, one for ticket holders who had been to the previous movie, one for ticket holders who hadn’t and a fourth for the unfortunate people on standby without tickets. I go into this detail because the ritual of deciding whether to leave the celebrity interviews to get in line and how to get food were a memorable part of the experience. Waiting in line was your chance to meet the other people. There weren’t many NSA types, as most were movie people with an interest in 3D. 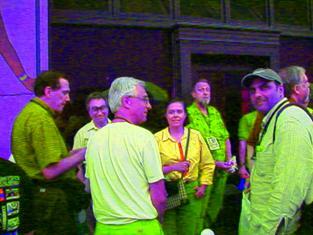 In addition to meeting other people from Georgia, we met about everyone connected with filming current or recent 3D movies – not usually the directors, but the 3D technical advisors. This got us a tour of the Crest National facility which converts movies to digital and makes CDs and DVDs. Oh yeh, then there were the movies. Many of the studios had made new prints for the event. In many cases, they were sloppily made, with adjusting the density or color properly. Others were superb. I expected to see a lot of poor movies, just made in 3D. Instead, I saw some movies which were quite good, despite prior reviews. In “Stranger Wore a Gun”, there was applause for the spectacular scene of the stagecoach coming around the bend and the opening Columbia logo in full 3D.